Short straddles are the inverse strategy to a Straddle (or Long Straddle). The Short Straddle is a non-directional trade where both a put and a call are simultaneously sold at the same Strike Price. 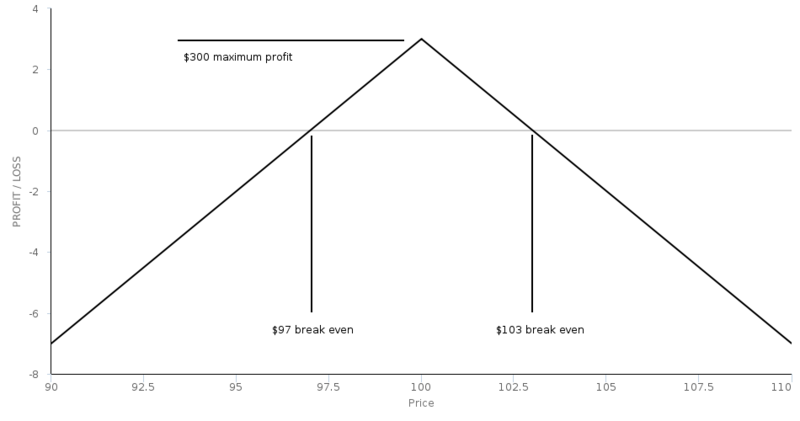 The Short Straddle is a Short only position which has limited profit but undefined risk. They profit if Volatility reduces or was less extreme than originally anticipated since the trader gets to keep more of the Premium received when both call and put Options were sold. If the price of the Underlying instrument either increases or decreases significantly then the losses can be considerable, for this reason Short straddles are considered high-risk trades. A lower-risk alternative to Short straddles is an Iron Butterfly strategy which uses two additional Long Call and put Options to contain losses (and also has the corresponding effect of limiting profit). As with Long straddles, the Short variant of this strategy can be used as a news trade (earnings announcements etc). In the case of the Short Straddle the trader will be anticipating Volatility to reduce significantly to enable them to quickly exit the trade at a profit. Net credit from sale of Straddle = $300. TastyTrade.com video about short straddles. Joseph Hargett gives an overview of Short Straddles. Informed Trades video explaining short straddles.